Do you want to get Moore From Life? Then keep learning! You only stop learning when you stop living. Take advantage of these opportunities to learn, grow, and prosper in all areas of your life. LIFE is a leadership development program for adults and kids, and business organizations too. Depending on which track you choose, you can study leadership, life skills, relationship building and faith formation. 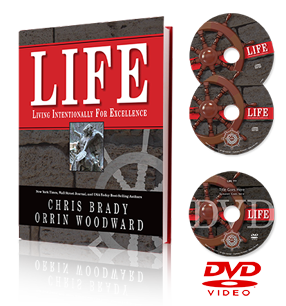 Your monthly subscription to LIFE includes books, audio CD’s, DVD’s, and live events. Moore From Life is proud to be an exclusive independent distributor of the LIFE program. Our family has been students of this information since 2005 and it has improved our marriage, our parenting, growing our businesses, and developing our faith. And if you really like how the information is helping you to get Moore From Life, then you can share it with others and make money too! To learn more or to get started learning and/or earning READ MORE HERE or send me a note in the BLOG CONTACT FORM. PATRIOTIC PROFIT is a BLOG and a book in progress that I have created to inspire small business owners to become active in politics. When business owners say, “I’m not interested in politics” I immediately ask them to clarify if they are running a non-profit or a for-profit enterprise; because unless you are running a non-profit enterprise, then your goal in business is to earn a profit. Since you cannot operate a business independently of the laws that govern your geography and your industry, it pays to be informed of and engaged in creating the environment that will enable your business to be the most successful possible. Through interviews and independent research/reading, I (occasionally) blog about the importance of being politically aware and active, and how capitalism has historically been the best method of creating successful enterprises. *Note: because of my varied interests at present, Patriotic Profit is not updated as often as I desire. However, I am still very passionate about liberty and encourage you to check back to see what is new! Since the search for a publisher to do a cardboard / board book has been difficult, I am moving on to a digital solution and researching how to publish an e-book and create apps for mobile devices. If you have any resources to help me accomplish this, please use the BLOG CONTACT FORM and send me a note! (if this post is still up, then I still need assistance). DON SWEETING – the former pastor of my church, Cherry Creek Presbyterian Church, and now the President of Reformed Theological Seminary, Orlando Florida. PLAY AT HOME MOM, LLC – becoming a mom has been the best job/endeavor/challenge I could have NEVER imagined. I have actually put a lot of my old passions and interests on hold, just to enjoy these first few years with my little one; including any gainful employment. As a former teacher who loves the idea of experiential learning, we have taken advantage of Colorado’s natural beauty and the cultural resources of Denver and gone on a lot of adventures. But, I do admit that I am severely lacking in early childhood education ideas and am not crafty at all. So I was very excited to hear about this website that continues to inspire me and my children.